Spirit camps hosted by the Yankton Sioux. Since leaving Bellingham on August 17 we have covered 1500 miles in four days to get to Ihanktonwan Territory in South Dakota, where I am writing from now. Crossing the Columbia River we learned of the victory at the Port of Morrow and offered prayers of thanks. In Billings we stopped to watch the passing of numerous mile-long coal trains headed west from the Powder River basin. 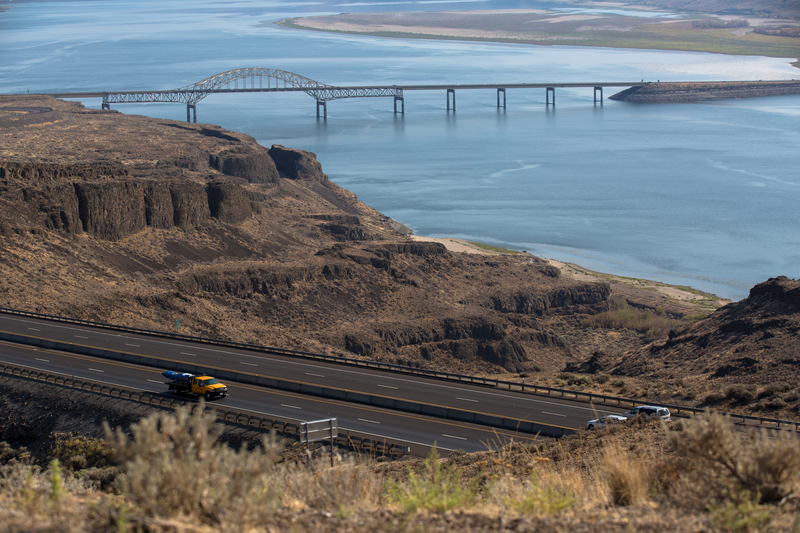 While in Ihanktonwan Oyate (Yankton Sioux) Territory the Lummi will touch up the totem pole, meet with tribal leaders and take part in ceremonies and a blessing of waters that would be poisoned by the proposed Keystone XL Pipeline. Waters from the San Juan Islands of the Salish Sea, traditional Lummi territory, will be mixed with those of the Missouri River in Ihanktonwan Territory as the totem pole is taken to Spirit Camps for prayers and blessings for all our relations, and for the Creation that is our shared responsibility and sacred obligation to witness, honor and protect. 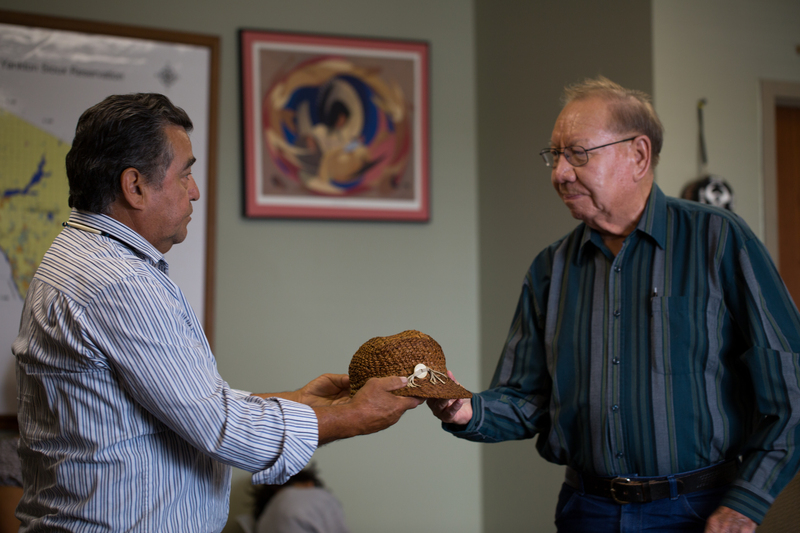 Lummi Elder Sit-ki-kadem (Doug James) gifts a traditional red cedar hat to Leo O’Conner, Elder and Tribal Treasurer from the Ihanktonwan Oyate (Yankton Sioux). O’Conner was the last person born in the Ihanktonwan village of White Swan that was flooded in 1952 by an Army Corp of Engineers hydroelectric dam project that took place without consent from the Ihanktonwan People. The tribe lost almost 3,000 acres of their homelands when the Fort Randall dam closed. “On this journey over here I knew this hat was going to be given away, but I didn’t know where, and I didn’t know who,” Sit-ki-kadem said. The cedar hat was woven by Tsilixw (Bill James), the Hereditary Chief of the Lummi People, and passed on to Sit-ki-kadem years ago. On Thursday, Friday, and Saturday, the House of Tears Carvers visited the reservations of the Ihanktonwan Oyate (Yankton Sioux) in South Dakota. While there, the journey met with elders leading the fight to protect sacred waters from the proposed Keystone XL pipeline and other fossil fuel megaprojects. Carvers put finishing touches on the totem pole and shared gifts with the elders of the Ihanktonwan Oyate people. Along the way to the Dakotas, carvers came across coal trains from the Powder River Basin. Lummi Elder Sit-ki-kadem (Doug James) gifts a traditional red cedar hat to Leo O’Conner, Elder and Tribal Treasurer from the Ihanktonwan Oyate (Yankton Sioux). O’Conner was the last person born in the Ihanktonwan village of White Swan that was flooded in 1952 by an Army Corp of Engineers hydroelectric dam project that took place without consent from the Ihanktonwan People. The tribe lost almost 3,000 acres of their homelands when the Fort Randall dam closed. “On this journey over here I knew this hat was going to be given away, but I didn’t know where, and I didn’t know who,” Sit-ki-kadem said. The cedar hat was woven by Tsilixw (Bill James), the Hereditary Chief of the Lummi People, and passed on to Sit-ki-kadem years ago. All photos are by James Leder (organizer with the Students for Renewable Energy and activist for decolonization). The Shift . . .